The MJSA Bookstore contains nearly 1,500 articles that have appeared in the association's award-winning publications, as well as numerous technical and business books from MJSA Press and other leading industry publishers. All can help you to achieve professional excellence in jewelry making and design. MJSA members can order any article free of charge, and they receive discounts on all book titles. If you already have an account with MJSA, please log in above. Otherwise, please click the Create Account link above; it only takes a minute. You can also begin shopping and create your account later. NOTE: MJSA members receive a 15% discount on all bookstore publications, if they use their MJSA-generated login and password. You can search for articles and books either by selecting a category from the drop-down menu below, or typing in a keyword. The 2018 print edition lists MJSA member companies that, together, supply everything needed to design, make, and sell great jewelry: the latest tools and equipment, findings and chain, gemstones and beads, metals, packaging and displays, plus contract and business services. It also includes articles on the following topics: Making the most of your tool and equipment budget, working with refiners, obtaining the best results from casting subcontractors, and jewelry trends for 2018. Click here to learn more. Winner, Bronze Award, Association Trends All-Media Contest! This practical guide from MJSA Press offers expert insights into all aspects of working with precious and non-precious metals. Have the characteristics of common alloys always at hand, plus advice for easier casting and bench work, managing scrap metal, marking and stamping regulations, and illustrated step-by-step techniques on a range of metalworking techniques. Click here to learn more. A basic, easy-to-understand guide on all aspects of running a jewelry design business, from identifying a target market to pricing, marketing, and selling your individual designs--all while having fun along the way. Jewelers have a wealth of options when choosing the tools they'll use for their creations, but everyone has a favorite tool with which they would never part, a "secret shop weapon." This book pulls back the curtain and reveals the "weapons" of nearly three dozen jewelers, from renowned experts to up-and-comers who are just beginning to make their marks. Secret Shop Weapons presents a full range of "must have" tools and equipment, from high-tech CAD programs and microscopes to such basics as gravers and miter-cutting jigs. Whatever the tool, jewelers share why their favorite weapons are so special and how they use them. Also included in this 160-page, full-color book are step-by-step projects featuring several of these weapons. In addition, readers will have access to exclusive online videos so that they can witness these tools in action. Prime Sponsor: Rio Grande. Click here to learn more and download sample chapters. Volume Two in the "Orchid in Print: Maximum Bench Work" series, published in collaboration with The Ganoksin Project. 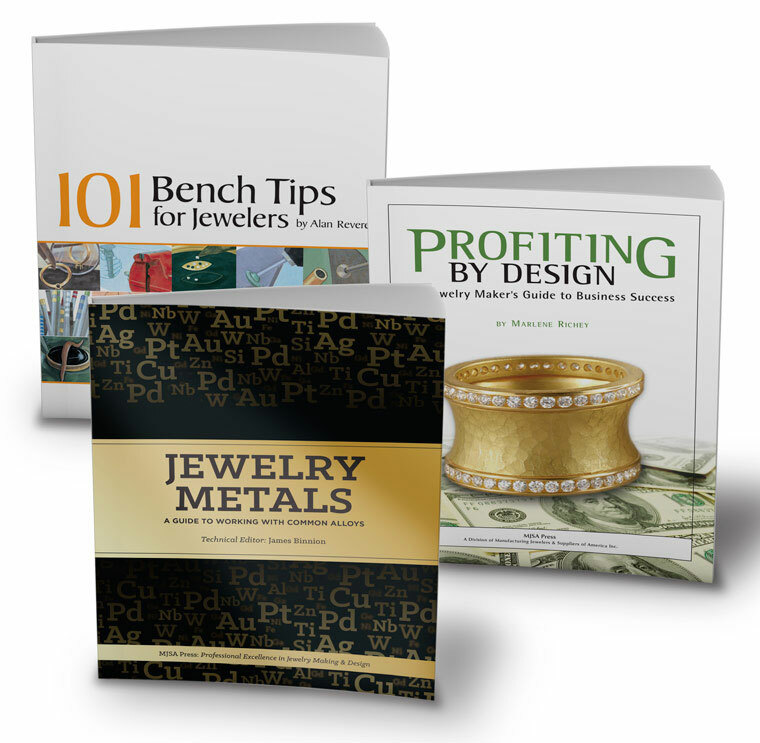 In The Jeweler’s Bench Book, acclaimed metalsmith Charles Lewton-Brain offers expert advice on how you can choose the bench that best meets your needs—then modify it for maximum efficiency. With plentiful full-color illustrations, The Jeweler’s Bench Book covers everything from the basics of bench design to ingenious tips for tool storage and arrangement. It also includes real-life examples of how renowned jewelers have set up their own bench areas. Prime Sponsor: Rio Grande. Click here to learn more. Curated from the pages of MJSA Journal and MJSA Custom Jeweler, the articles in this PDF handbook cover a range of topics: Determining a client's style; avoiding the "intimidation factor" when explaining custom design to a client; creating both magnetic marketing campaigns and memorable in-store experiences (such as "gemstone roundtables" and hands-on casting sessions); choosing and using CAD/CAM; and repurposing heirloom gems. MJSA members: To download the handbook, click here and follow the download instructions. You will need your member login code and password. The PDF publication contains the best of past MJSA Journal and MJSA Custom Jeweler articles on this perennially popular subject, offering strategies for pricing both finished jewelry and repair work. The Handbook includes best practices for cost accounting (including a step-by-step guide to factoring in overhead costs, one of the most-overlooked areas in pricing); pricing uniqueness in a design, including custom work; and turning a repair operation into a profit center. It also provides successful strategies developed by working designers and jewelers, such as Susan Helmich, Mark Morrell, and David Geller.